Available in all formats at the BCR Webstore now. In stores worldwide May 6th. 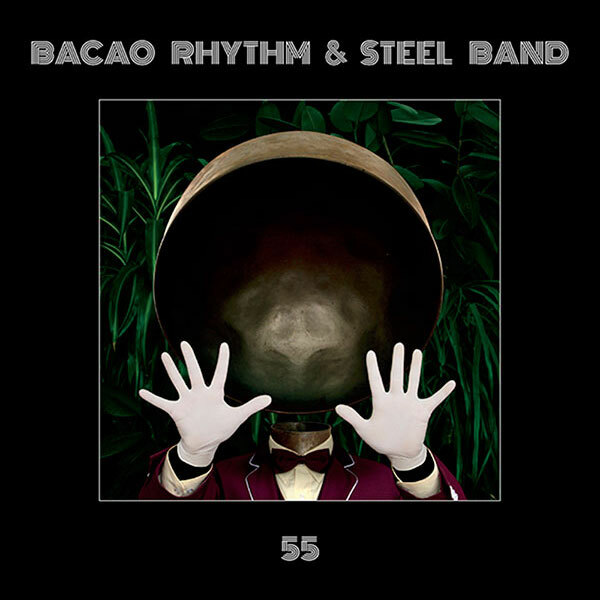 Shrouded in mystery, hailing from Hamburg, Germany, Bacao Rhythm & Steel Band (BRSB) releases their long awaited debut “55” on Brooklyn’s own Big Crown Records. Long time multi instrumentalist and band leader Bjorn Wagner spent a few months in Trinidad & Tobago where he became fascinated with Steel Drums. His initial intrigue with local steel pan music culture led him to learning the instrument both through help of local players and on his own. After he became proficient on the pans Bjorn had his own instrument built from a used oil barrel by legendary pan man Louis C. Smith. Upon returning home to Germany, Bjorn set out to blend the Tropical Steel into his already sharply honed Funk, Soul, and Hip Hop sensibilities. The outcome is an updated take on a classic format, a truly unique sound. Their first two recordings were covers of The Meters “Look A-Py-Py” & “Ease Back” which they self released on a 45. Looking back on these two sides you can tell they were just getting their chops up for what was to come next. This is evidenced by how all hell broke loose when they went on to cover 50 Cent’s hit PIMP taking the DJ and vinyl collecting communities by storm. Many people thought the recording was the original sample and probably still do to this day when it is played. The original Mocambo pressing sold out quickly and is now a collector’s item fetching heavy prices when it changes hands. It was this tune that made the introduction between Bjorn and Danny Akalepse of Big Crown. They immediately hit it off and starting making plans to do a full length project with the band. Keeping in the tradition of Steel Drum records, 55 is a journey through re-interpolations and covers with an updated approach, pushing Steel Pan music to uncharted territory. Flawlessly bringing previously untouched genres into the steel pan cannon ranging from Underground Hip Hop tunes to staple Funk tracks and some of all that falls in between. From the smoothed out Reggae cover of John Holt’s “Police In Helicopter” to the DJ sure shot cover of Faith Evan’s “Love Like This” BRSB’s 55 is reinvigorating tunes both well known and helping to shed some light on tunes still largely undiscovered. However, some of the strongest tunes on the album are original compositions, from spaced out Disco vibes on “Beetham Highway Ride” and “Port Of Spain Hustle” to the ugly face inspiring drums of “Laventille Road March”. Recorded to analog 8 track tape at The Mocambo Studios in Hamburg, 55 is a gritty, punchy journey in sound drawing on music from around the world, using production aesthetics from across both eras and genres, all coming together seamlessly. If the 45s that have already come out on Mocambo, Plane Jane, and Truth & Soul are an indication, this full length is going to be a staple to both casual listeneners and Disc Jockeys alike. Catch BRSB live in Fall as they tour the world with the mysterious heavy sound that is in fact, all their own.